Yesterday was ridiculously busy. The closet project was so overwhelming I spent half the day cleaning the bedroom carpet instead. Procrastinating by cleaning...a good thing, or still avoidance? What it meant was late to bed, because I still finished the closet section as scheduled. Today wasn't quite so bad - and the closet is done! There are still things that need to go into the closet, but the whole thing is organized and ready to go. Yesterday's block - Texas Puzzle - was the fastest block I've made all year. 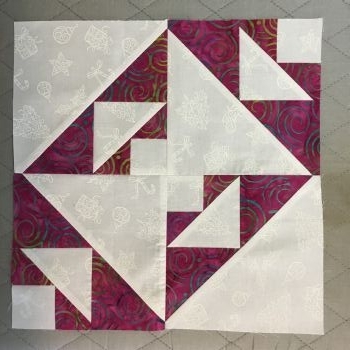 Four half-square triangles and three sashing pieces...way easy. Today's block - Blacks and Whites - is more complex, but still not difficult. 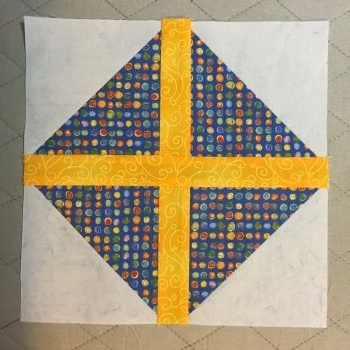 I think it's a pretty block. I considered using some of my black fabric, but decided the pink/purple batik was better. Only one block left! Why does that make me nervous? Pay it forward. Take a photo for a tourist or open the door for someone. Random good deeds are pleasant surprises. You have no idea how it affects other people, especially those who aren’t used to being treated that way. More than how it makes the people you help feel, you might even start a ripple with your intentional generosity and helpfulness.